A rural idyll: that’s what Catherine Parkstone is seeking when she sells her house in England and moves to a tiny hamlet in the Cévennes mountains. Divorced and with her children grown, she is free to make a new start, and set up in business as a seamstress. But this is a harsh and lonely place when you’re no longer just on holiday, and Catherine finds herself with unexpected battles to fight. French bureaucracy, the mountain weather, the reserve of her neighbours – and most unsettling of all, her own fascination with the intriguing Patrick Castagnol. The Tapestry of Love is the story of how a woman falls in love with a place and its people: a portrait of landscape, a community and a fragile way of life. “The Tapestry of Love… is a novel that is interested in showing romance growing in the lives of real characters in the middle of lives preoccupied with other important aspects of life… It’s very relaxing and entertaining to read. It’s also smarter and more observant of the details of human interactions than that line might suggest. Rosy Thornton uses such a subtle, natural touch when she writes her characters and the world they live in, that the result feels emotionally real. The landscape around Catherine’s cottage and the descriptions of the seasons adds a rich feeling of sensory detail to the novel. And the sensory detail extends into the descriptions of the tapestries Catherine produces, the meals she eats and the animals she sees around her cottage… Thornton’s remote France is a comforting place to spend hours, because of all the thick smells, tastes and weather she writes into the location, which wrap around you as you read. “Rosy Thornton has written the most beautiful book.” – Cheryl’s Book Nook. 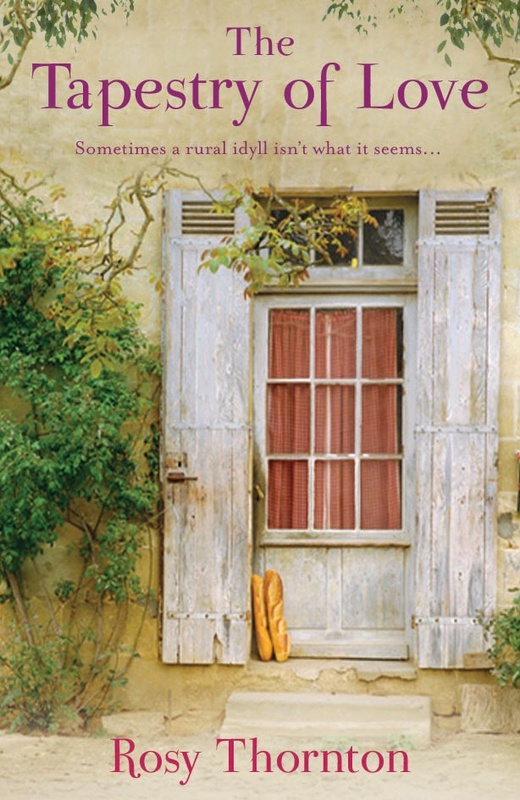 “Rosy Thornton’s deliberate layering of setting and character create a languid story that is as French in its meandering as it is in its set location. Do not let this description fool you however; The Tapestry of Love is a powerful story of reawakening and a coming-of-age story for the over-forty crowd… Reminiscent of stories by authors like D. H. Lawrence or Thomas Hardy, the setting is as much a character as Catherine or Patrick is… Ms. Thornton captures the ambiance and flavor of Cévennes with her lush descriptions and painstaking detail. In fact, she builds the setting color by color, just like Catherine builds her tapestries. The tie-in is brilliant and effective. Thoughtfully written with unexpected elements of humour but also deep sorrow and emotion. A lovely read. Thank you Rosy for introducing me to this novel. Hello Rosy. I adore The Tapestry of Love. I have read it over and over. Are you planning a follow up? I so hope you are, you are a rare find indeed. For me, your book is a wonderfully evocative, superbly descriptive and has a real intelligence.